I have been making some gift bag and matching card sets lately and thought I better get them posted before you guys think I gave up on crafting completely! This first one is actually the one I made yesterday. Uh...and the day before. The whole Dexter Season 1 and 2 marathon made me a very slow crafter. I will tell you that I am posting a picture of the cutest giftbag. I got lazy and only did tissue paper on two of the large cupcakes. I got to thinking that these will probably be thrown away and I don't want to put that much effort into trash. 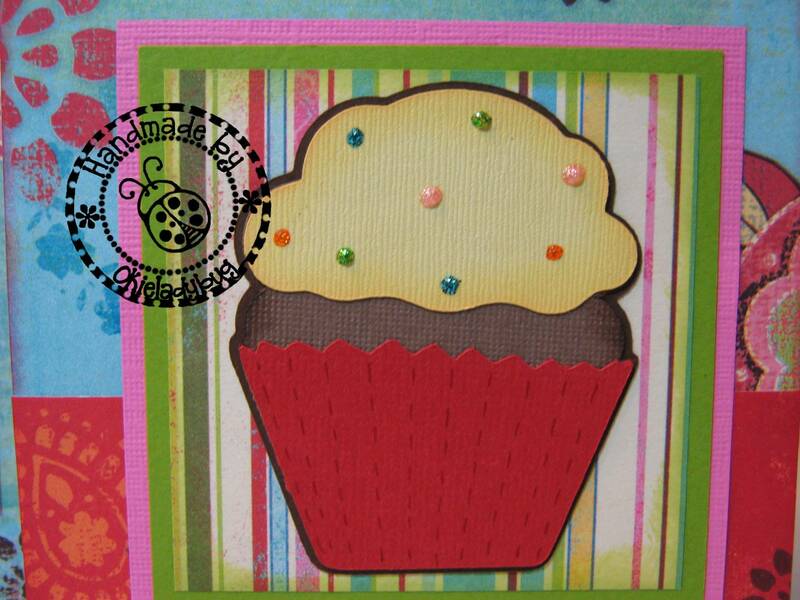 On the cupcake for the card I just Stickles to coordinate with the brads I used on the larger cupcake on the gift bag. I didn't write anything in the card thinking people might want to use it for something besides a birthday and they could write their own sentiment on the inside. I cut the paper wrong for the card, I meant for it to run vertical instead of horizotal, like on the gift bag but once again I was on the phone and screwed up *okie thinks she really needs to stop talking on the phone and crafting because she messes up a lot of chit this way*. 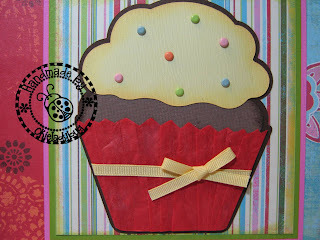 On this larger cupcake I just used gift wrap tissue and folded to match the cupcake holder on the Cricut cut. I know the tissue paper does make it look so much nicer, but it was not an easy feat and I didn't want to do it on all four. Since these will be used as prizes at my Christmas party this year and most of my guests are not paper crafters they will never know that the tissue paper looks so much better. 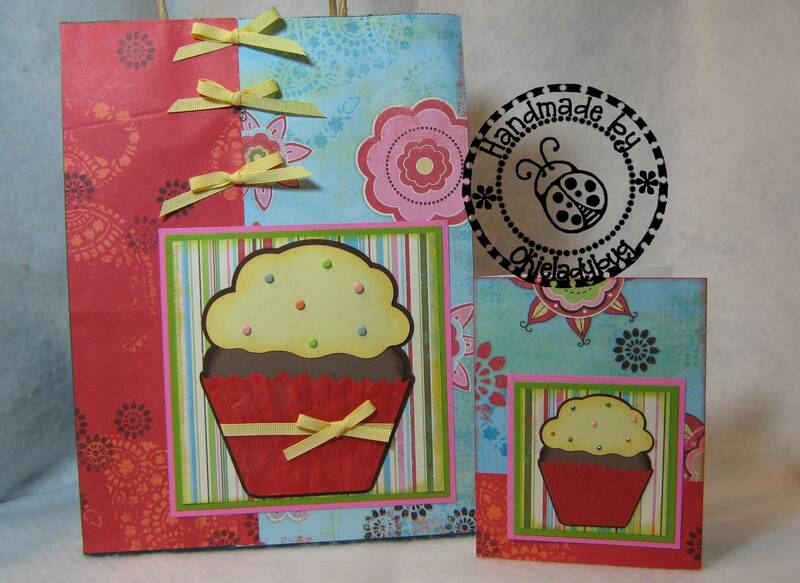 I will be posting gift bag card sets for the next few days. What a cute set! Love the 3 little bows on the gift bag. I love the gift bags. I have never done gift bags before though and would love to try my hand at them. I need details...details....details. How do you make them? real cute...nice job inking, and i like the colors. 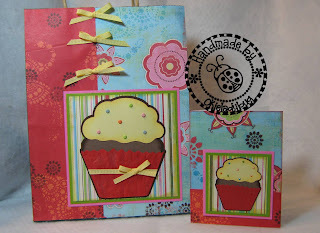 Cute card and cute bag! What a great way to give a gift. 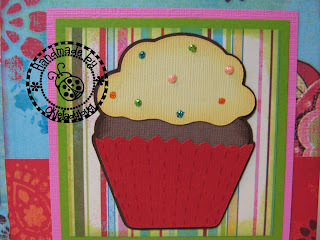 Rhonda H said....I like the cupcakes both ways. I agree. You only have so much free time to craft. Make some things easy on yourself. They both look good. Hey, you did more work on a gift bag/card set than I would have! I should really make some of these for the gift wrap closet. I am forever buying gift bags on clearance then not doing anything with them and at the last minute just put curly ribbon on the handle. Lame. So cute. Who would ever throw that bag away. Not Me. It takes time to create beautiful projects like that! this is sooo okie-dorable! TFS! Great job picking papers and putting it all together. Brads, stickles and ribbon are great touches.